Dear HO Scale Customers: one of our customers sent us a link today of a new review on the NARC Brake lInes. For thise of youwho are interested, click on the link below. A set of vehicles under multiple unit control is referred to as a consist in North America. 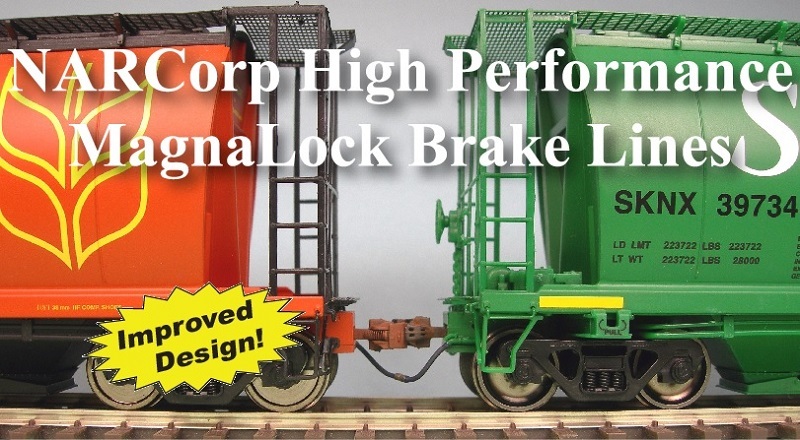 The new North American Railcar Corporation HO Scale MagnaLock MU Cables add even more realism to model locomotives. When North American Railcar Corporation introduced our MagnaLock Brake Lines, the response was overwhelmingly positive. Modelers had been looking for something like them for years. And while our first generation MagnaLocks are fully functional and look great, our experience and feedback from modelers has led to the development of our second generation MagnaLocks with improved features and more realistic appearance.